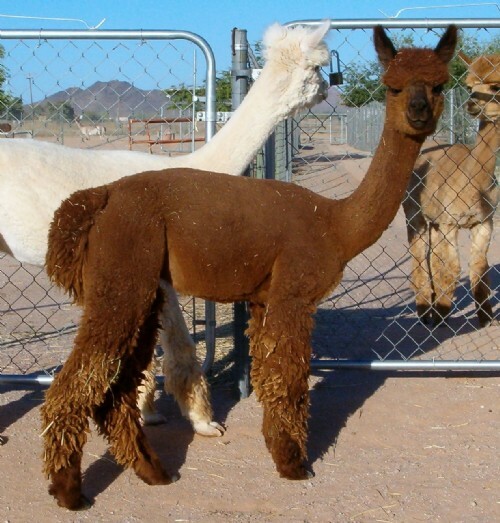 This ¾ Peruvian boy is destined for our breeding program. A descendant of Peruvian Pachacuti on the bottom and Alianza Peruvian Choco on the top, quality just shines in him. He just recently made his show debut in a very competitive level 4 show. We took a fourth. Aries was the youngest in his class, with those placing over him having have almost a full years growth over him. The judge complimented his conformation and stated that she would like to see him as he matures. Aries conformation is very straight, his bite is excellent and his fleece is fine and consistent through out. Update: Aries' first cria has hit the ground; a true balck male with his father's stellar conformation.